FORMED by just four farmers back in 2000, Oz Group is now the biggest blueberry co-operative in Australia representing 150 growers from Macksville to Grafton. They recently took on their first organic supplier from Bundaberg. 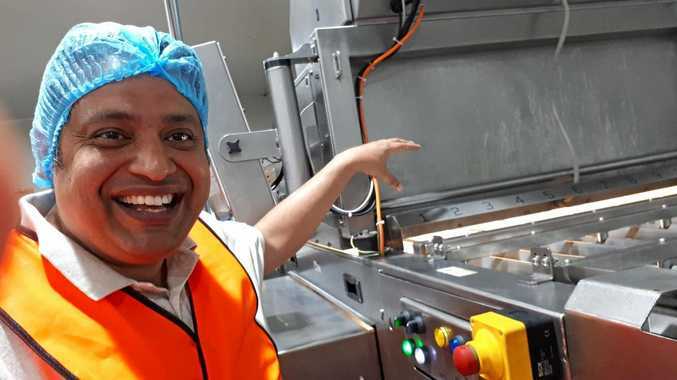 With plans for further expansion this year The Advocate took a look around their high tech packing facility at the old Bunnings building near the Englands Rd/Pacific Highway roundabout. The factory packs for 52 weeks of the year but volumes go up and down depending on the season. Their machines can pack up to 1.2 tonnes an hour. Operations manager Manpreet Bedi demonstrated some of the latest equipment including a metal detector in case of a repeat of the strawberry contamination case. When the facility opened four years ago it employed three permanent staff but that number now stands at 33 and it's a more skilled work force according to Manpreet with new technology taking over the more manual tasks. The Oz Group Co-op supply 100 per cent of their produce to Driscolls who organise supply directly to supermarkets. CEO Brett Kelly acknowledges there is some concern in the community about the industry which has expanded so rapidly in recent years but has stressed it is a local, one hundred per cent farmer-owned co-operative that creates economic value for the region. "We are the largest industry in Coffs Harbour in terms of the income generated that goes back into our economy. Last year we turned over $135 million and the year before it was $80 million. "The majority of our farmer growers have the best intentions. Our focus is to continue to train, develop and have best practice compliance at farm level. If we get any members not abiding by the co-operative rules and standards they risk being kicked out of the co-op. There are plans to double the capacity of the packing facility this year but negotiations are still to be finalised with the RMS in relation to land acquisition for the bypass.